DALE EARNHARDT'S 2000 NO-BULL MONTE CARLO THIS MODEL WAS BUILT AS THE CAR DALE DROVE TO A SECOND PLACE FINISH IN THE CHEVROLET MONTE CARLO 400 AT THE RICHMOND INTERNATIONAL RACEWAY ON SEPTEMBER 9 , 2000 . THIS MODEL WAS BUILT USING THE MONOGRAM DALE EARNHARDT 2000 MONTE CARLO KIT . I REMOVED THE REAR SPOILER & REPLACED IT WITH A MORE TO SCALE SPOILER . A COMBINATION OF SLIXX DECALS#1515-0003 & 1402-9903 WERE USED TO REPLICATE THE NO-BULL PAINT SCHEME . TAMIYA ACRYLIC LAQUER PAINTS WERE USED ALONG WITH SHABO TIRE LETTERS . HERE'S A FEW PHOTOS FROM OUR CLUBS CONTEST THIS PAST WEEKEND. 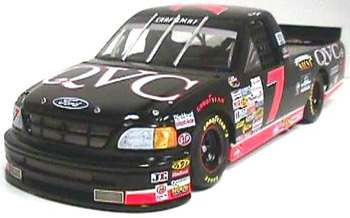 THIS IS THE SUPERTRUCK DAVE REZENDES DROVE IN 1996.